Is there more to the R927 than small size and large price? The digital camera market can be a confusing place. You can now buy a compact, prosumer or DSLR camera for around the same price. HP has stayed clear of the DSLR market and instead has concentrated on its range of seven compacts. But their latest high-end model will have to offer photographers more than just convenient pocket size when it's priced at nearly £400. The snappily named R927 sports an 8.1MP sensor, 3x optical zoom and large 3-inch LCD screen. 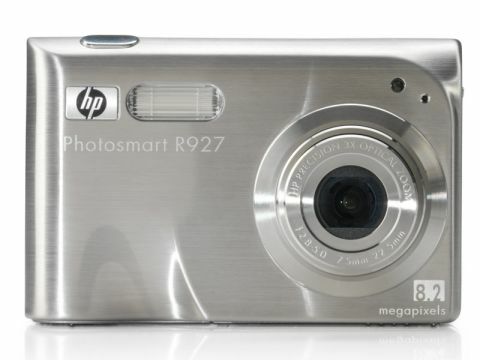 The R927 has a similar straightforward appearance to the rest of the HP compact range. Its stainless steel outer shell looks hard wearing and the seven buttons, four-way controller and L-shaped zoom rocker are all positioned logically. Start-up time's almost instantaneous, with the camera ready to shoot within a couple of seconds. Covert photography might be hampered slightly by the noise of the lens popping out and the sound of the auto focus, but for most shooting scenarios it's not overly distracting. The camera weighs in at 200g, which is light enough to carry around without it feeling like a burden, and its simple ergonomics mean that it feels comfortable in the hand. It offers an impressive 16 shooting modes, including a full Manual option that can be accessed instantly via the four-way controller or selected via the menu. The default Auto setting copes effectively in a well-lit outdoor shooting environment. There's an accurate white balance setting for excellent colour rendition. For anything a bit more challenging it has a mode to suit - the Night Portrait option works particularly well. Also worth mentioning is the Panorama setting that lets you shoot between two and five images to be stitched together in-camera. It's one of the easier ways of capturing vistas without needing supplementary software or even a tripod. Lining up a series of images on the LCD's helped by an outline preview of where the overlap should appear for the next shot. Once you've finished shooting, the camera stitches and records a wide-angle panorama in seconds. One major downfall for a camera at this price though, is the R927's limited sensitivity range. The ISO 100 to 400 settings are adequate for general shooting but capturing sharp images in a low-light environments is almost impossible without the supporting the camera. The three different types of metering options perform well and the R927 also offers some neat solutions for trickier lighting circumstances. Adaptive Lighting sorts out sharp contrast illumination, with shadowy areas lightened. There's also a bracketing option for three successive shots with a one f-stop exposure difference in each direction. With an equivalent focal length of 35- 105mm, the lens could do with being a bit wider. However, when it comes to image quality the 1/1.8-inch 8MP CCD sensor delivers decent results. Images are sharp and clear with good colour rendition and low noise. If that isn't enough to please most amateur users, the R927 has another trick up its sleeve. HP calls it the Design Gallery and it enables you to apply effects, such as Cartoon, Watercolour and Slimming options. Images can also be cropped and rotated, colours tweaked and borders added, all with consummate ease and pleasing results, even if some of them are really just novelties. Overall, the R927's a solid, all-round performer. It hasn't been designed to set the photographic world alight but rather to satisfy the computer-phobic photography enthusiast - and largely succeeds.